The chairperson of the National Student Financial Aid Scheme (Nsfas) Sizwe Nxasana announced on 9 August that he was resigning from the funding body. The higher education minister Naledi Pandor said applications for 2019 Nsfas would be closed until further notice. All the while protests continue at universities with students asking for their allowances. In July, Pandor asked Nsfas to suspend applications for the 2019 academic year. This was due to the severe backlog in the allocation of student funding for 2017 and 2018. She wrote to Nxasana regarding her decision to temporarily suspend the applications. At the time, Pandor also revealed that her department would be investigating the funding schemeâ€™s processes in August. Following on from her decision, there were many calls for Nxasana to step down. Nxasana confirmed to News24 that he would resigning and had informed Pandor of his decision on Monday. Nxasana further said the institution had an extreme strain ever since former President Jacob Zuma announced on December 16 2017 that free higher education would be made available. However, despite the seemingly many problems which have plagued Nsfas from even before the free education announcement, Nxasana has maintained the organisation is fine. “But yes, there are challenges facing NSFAS. The environment changed after the announcement by the then-president (Jacob Zuma) last year about the extension of free higher education and we had to change our systems and processes to accommodate the new situation. Government will now have to decide how to manage it going forward,” he said. Ahmed Bawa, the CEO of Universities South Africa told The Daily Vox in an interview that the resignation of Nxasana has led the minister of higher education to be in the process of appointment an administrator. He said this is a mechanism which comes into place if the board of a university or something like Nsfas doesnâ€™t function. â€œThe functioning will continue but it will continue under the direction of the department and ministry,â€ Bawa says. On Sunday, Pandor announced the board of the institution would be dissolve. As result of the delays in payment, the higher education ministry said they would be appointing an administrator which would lead to the board being dissolved. Clarifying the announcement made by Pandor, Bawa said she has not shut down the applications and has said there is a need for Nsfas to completely the 2017 and 2018 funding issues before it opens up the application cycle for 2019.
â€œIf Nsfas focuses on those two things: you know just closing out 2017 and 2018 that then it will be in a much better position to deal with 2019. Also I should add with the new funding system which is a bursary system if you like the burden of administration is reduced. So even if the application cycle is opened in September, there will be enough time for students to be reduced. So at this point we are not worried,â€ he said. Bawa says at this point there shouldnâ€™t be that much of problem of distributing that resources as the data problems have been resolved. He hopes that by August that process will be complete and then there can be a move to the 2019 cycle. Amidst all of the problems plaguing the institution, protests have continued at universities around the country especially at the historically black universities and TVET colleges. At the University of Limpopo (UL) and University of Venda (Univen) students have been striking for the past few weeks over the delays in allowances and bursaries being made out. This is not the first time though students have been striking this year. Earlier students protested over the delays in Funza Lushaka bursaries being paid. Students have maintained that they will continue to strike and shutdown the university until their allowances are paid out. According to students at Univen only about 15% of Nsfas students have received their allowances. There has been a continued confusion about who is responsible for the dispensing of the funds. Accorded to the process, universities are supposed to submit a list of eligible students to Nsfas. Once the list has been approved, Nsfas is then supposed to transfer the funds to the universities, who have the responsibility to give those funds to students. However, with all the problems at the universities, there has confusion at which stage of the process the problem lies. Universities say Nsfas needs to send the money while Nsfas has said the universities need to give the money to students. Bawa says the problem lies mostly in the universities where the majority of the students are Nsfas students struggle. It is the historically black universities and universities of technology who are the ones who are bearing the brunt of this. 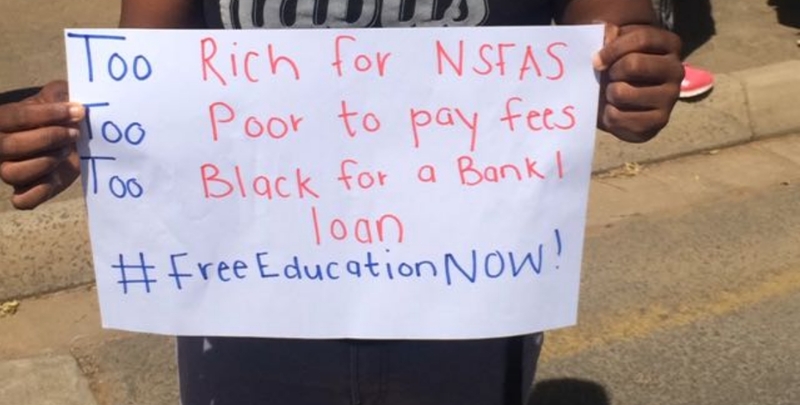 There greater conversation that needs to happen around the funding issues in South African universities is whether Nsfas is equipped to deal with the dispensing of funds to students. Bawa says the financial aid scheme has has been dysfunctional for the past 15 years or so. This can be seen in the crises that has been happening and is currently taking place at universities of technology and the historically black universities. Bawa says the system should be based with the new central application system so when a student is admitted to university, the bursary is administered and there is nothing else to be done. It was just last year during the 54th African National Congress (ANC) in December that the former president made the free higher education announcement. Bawa says there should be sympathy towards Nsfas as they have to run two systems concurrently: the old system and the new bursary systems. They were only given two week period they had to get their act together, and Bawa says they didnâ€™t unfortunately. We have reached out to Nsfas for comment. This story will be updated once it has been received.